Diya Mirza at the promotion of "Acid Factory" during the Fashion show. Diya Mirza at the promotional event in Mumbai. Diya Mirza at the premiere of "Paa." Fardeen Khan, Archana Kochhar and Diya Mirza at the promotion of "Acid Factory" during the Fashion show. Sophie Chaudhary and Diya Mirza at the party of "Acid Factory" in Mumbai. Diya Mirza at the party of "Acid Factory" in Mumbai. Diya Mirza at the wedding reception of Rashi Agarwal and Hemant Bhanadari in Mumbai. Arshad Warsi and Diya Mirza at the promotion of "Hum Tum aur Ghost" during the Holi celebration. Diya Mirza at the soiree by Head of Reliance Group of Industry Head Anil Dhirubhai Ambani and Tina Anil Ambani. Diya Mirza at the Awards Ceremony in Mumbai. Diya Mirza at the press conference to announce the details of the IIFA weekend 2005 and the IIFA awards. Diya Mirza at the opening of the Middle East International Film Festival (MEIFF). Diya Mirza at the product launch of Samsung Mobile. Diya Mirza at the Inaugural MTV IMMIES. Diya Mirza at the press conference of "Crazzy4." 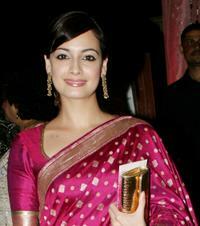 Diya Mirza at the inaugural function of the International Indian Film Academy (IIFA) Awards 2008 weekend.